A rendering of the proposed project in the Ladies' Mile Historic District. CHELSEA — A developer should be required to include affordable housing in its plan to construct a mixed-use building if the city allows it to build more units than the district's zoning rules permit, advocates and officials say. Acuity Capital Partners has applied for a special permit it needs if it wants to build 66 market-rate apartment units, commercial space and a parking garage at 38-42 W. 18th St. in the Ladies’ Mile Historic District. The permit will allow Acuity to build 26 more units than the 40 it originally planned to construct. But advocates including Manhattan Borough President Gale Brewer, Community Board 5 and the Municipal Arts Society of New York argue that under Mayor Bill de Blasio’s new citywide rezoning plan, any developer that receives a special permit that adds significant new floor area should have to comply with Mandatory Inclusionary Housing (MIH) rules, which require certain construction projects to include affordable housing units. Zoning code states that projects are subject to MIH “when a special permit application would allow a [more] ‘significant increase in residential floor area’ than would otherwise be permitted,” MAS said in a statement. The additional 26 residential units would represent a “significant increase,” the organization maintained. In May, a Department of City Planning spokeswoman asserted the Ladies’ Mile project was exempt from MIH because it is applying to “change the shape of the building and use square footage it is already entitled to” by zoning laws with a special permit, not to expand the total square footage available to developers on that lot, Crain’s New York reported. 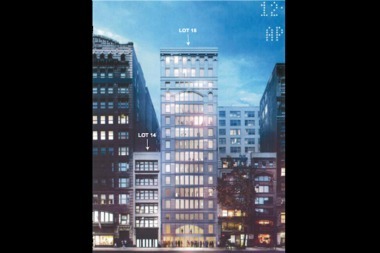 The Landmarks Preservation Commission has already approved the project, according to Crain's. "We have been clear since the time we introduced MIH that where residential capacity is not being increased, but only moved or reshaped, that [the policy] would not apply in those situations, which would raise other legal issues and challenges to meeting our housing goals," a Department of City Planning spokeswoman said in a statement provided to the outlet. At a City Planning Commission hearing on Wednesday, Acuity’s land use attorney Valerie Campbell stood by that interpretation. Applying MIH in this case “would create a significant disincentive for future [applicants], who may elect to develop hotels and offices instead of a residential building,” she added. The commission will discuss the project during a public review session, and vote on the project no later than the beginning of August, a DCP spokesman said on Thursday.